A private transfer from Paris Airports - CDG (Charles de Gaulle) or Orly - to a hotel in Paris or to another address in Paris will be very much appreciated because the driver will wait for you just outside the customs exit with a sign with your name on it. Your first impression upon arrival in France is paramount and will dictate the success of your holiday. That is why your transfer is so important, a timely pick-up, a knowledgeable, pleasant English Speaking Driver* and a clean and comfortable vehicle are the essential ingredients! Our experienced drivers will also be excellent advisers on many insider's details during your stay in Paris. and we will contact Driver immediately. The meeting point is just after Customs Exit. The driver will hold a signboard with passengers' name written on it. At the head of the train, right at the end of the Platform. Clients mustn't use stairs or elevators, driver is waiting for them on the same level. In the lobby, near the Concierge desk. In front of the apartment. Driver should arrive 5 minute in advance. from any public phone (no coins or credit cards needed) or dial +33 (0)1 3969-1815 from any US Cell phone. We are fully insured with Groupama Insurance company, contract N° 51 319 807Y. Paris My Way may not be held responsible for any accident, delay, disruption, strike, bad weather or loss of personal belongings. We reserve the right to change or cancel tours without notice when necessary for our passengers’ comfort and safety. No refunds will be issued to customers should they decide to interrupt their excursion. There will be no refund for cancellations less than 24 hours before the scheduled departure. In case of « no-show » at hotel of the clients without any notification, the driver will wait maximum 30 mins in the lobby of the hotel and then will leave. At train stations, driver will wait 30 mins maximum after train arrival. At Airports, the driver will wait 75 mins maximum after plane landed. We will charge 100% in case of no-show. Claims must be received less than 30 days after the date of the tours and must include a copy of the exchange form/receipt. Where will I meet my driver: at the Airport, at the Hotel, at the Station ? At the Hotel, your driver will meet you at the Reception, near the Concierge. 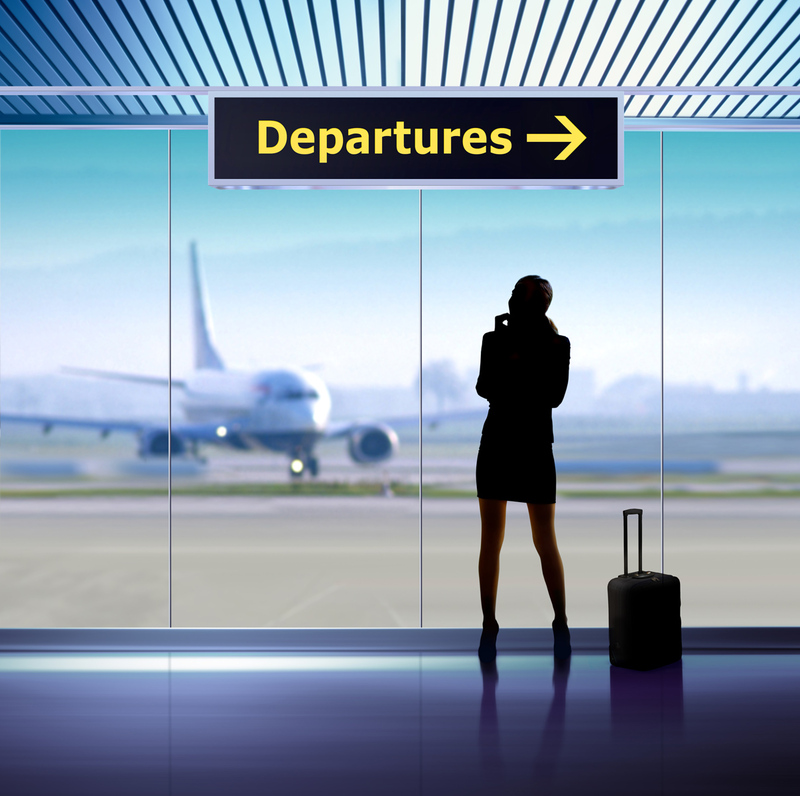 At the Airport, your driver will be waiting for you after the Customs Exit. At the Station, your driver will be waiting for you at the end of the Platform. In order to make it easy to identify your driver; he will have a signboard bearing your name. Would it be possible to pick me up, or drop me off, at a private address such as a friend’s apartment ? Of course, as long as it’s an address in Paris. How long will I have to wait for my driver ? At the very latest, your driver (or guide) will be there at the time indicated on your voucher. If I am late at the hotel, will my driver wait for me ? For how long ? If for any reason you are late, it is agreed that your driver will wait a maximum of 30 minutes. Above this time the service will be considered as a Client No-Show and charged 100%. What happens if my flight or my train is late; and I can’t help but arrive late ? 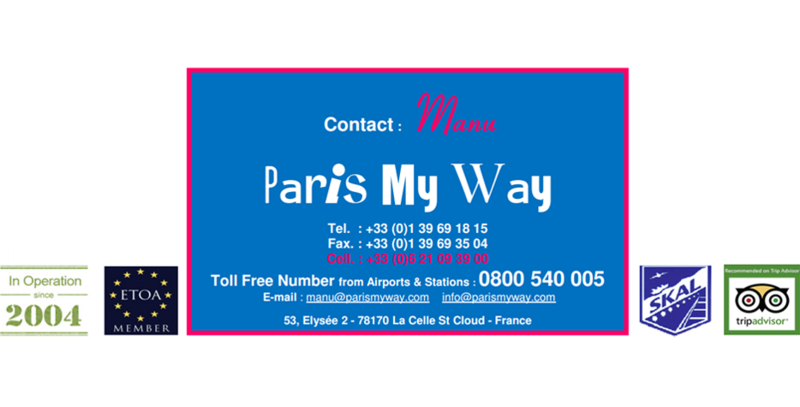 If it is a case of force majeure, you will need to either call your Agency, or the Paris My Way toll-free number 0800 540 005. What language will my driver speak ? Our drivers are all French, but all can speak English, or Japanese if indicated at reservation stage. Our vehicles are designed to transport people, and can easily contain one suitcase and one piece of hand-luggage par person. Do you work at night ? We do not work between midnight and 3am. I have not yet received an email confirmation. What do I need to do ? We systematically send an email confirmation within 48hrs after receiving your request. However, if you haven’t received anything before then, then please call this number +33 (0)1 39 69 18 15. If I wish to cancel a service that I have reserved, what are your conditions in this case ? However, if you decide to cancel a service that is already taking place, there will be no refund; under any circumstances. How many days before the service is it possible to cancel without charges ? It is possible to cancel without incurring any charges if this is carried out at least 24hrs prior to the time and date of the service. How long in advance can I make a reservation? Is there a date limit ? You can make a reservation via our online system, up to 48hrs prior to the time and date of the service. Otherwise, you can always call our number +33 (0)1 39 69 18 15. Are your vehicles equipped with Air-conditioning ? Is it possible to smoke, drink or eat in the vehicle ? All of our vehicles are fully air-conditioned. If you require it please ask your driver to turn it on. It is however strictly forbidden to smoke, drink or eat in the vehicle, or to do anything that could damage the vehicle and affect the comfort of clients using it after you. Up until where does the driver take me ? Is it possible that he helps me with my luggage until my train cabin ? Flight Check-in Counter ? Your driver takes you to the point indicated on your reservation details. It is perfectly possible for him to take you up until the Flight Check-In Counter, and/or help you with getting your luggage to your train cabin. This must be requested at reservation stage, and will be subject to a supplement on the price. Is it possible for the driver to help me with checking-in at the Airport ? At Duty Free ? Until I obtain my Boarding Pass ? It is perfectly possible that your driver helps with your flight check-in, or at Duty Free (20 minutes maximum), and even up until you receive your Boarding Pass. This must be requested at reservation stage, and will be subject to a supplement on the price. Can I extend the duration of the service with the driver ? You need to speak to the driver about this, and we will do all we can to satisfy your needs. I have a special request, different from those that you propose: is it possible to have a private driver « made to measure » ? Absolutely, for any requests of this type, please call our number +33 (0) 1 39 69 18 15. I have a service request outside of Paris; can I still use your services ? What is the difference between a « Licensed Driver-Guide » and a « House Driver-Guide » ? Our « House Driver-Guides » are passionate about their jobs, and have a wealth of experience and knowledge. They are not, however, qualified to do guided visits inside such places as the Louvre, Versailles Palace etc. Our « Licensed Driver-Guides » on the other hand are. In case of emergency, on which number should I call ? Our emergency number is 0800 540 005, this is free from any telephone. You can also use the +33 (0) 1 3969 18 15. What are the methods of payment ? When do you debit the sum due ? Will my Credit Card be debited the moment I make the reservation ? You can decide to pay the day of the service or by Credit Card (VISA or MASTERCARD) at reservation stage. We will only debit your Credit Card (VISA or MASTERCARD) once the service has started. I need a service to give my Fiancé(e) a surprise. Do you have any drivers/services that are orientated around the « Romantic Paris Theme » ? Our drivers all have specific specialties in various domains. Paris being surely the most romantic city in the World; we have drivers that are familiar and passionate about this aspect of Paris. I remain several hours in Paris between two planes, or two trains. Do you offer any « Stopover » services ? Must I give the driver a tip ? This is purely and simply at your discretion.